NASHVILLE, Feb. 27, 2018 /Christian Newswire/ -- Radio programmers at "Proclaim 18," The National Religious Broadcasters (NRB) International Christian Media Convention in Nashville, Feb. 27-Mar.2, are being introduced to a new program that tackles the "Acts 8 problem"—people who don't understand the Bible. While best known for making God's Word available in places where people do not have easy access to a copy of their own, Bibles For The World (BFTW, www.biblesfortheworld.org) is turning some of its attention to helping those with readily available Scriptures make more sense of it. 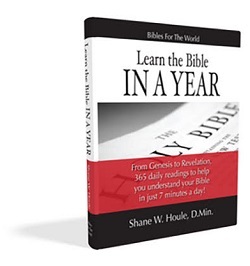 In addition to radio, the Learn the Bible in a Year series can be followed at the BFTW website (biblesfortheworld.org/book), where subscribers can listen to episodes and download accompanying study materials designed to be completed in just seven minutes a day. It is also available as an iTunes podcast (hitunes.apple.com/us/podcast/learn-the-bible-in-a-year/id1348881594). Since 1971, Bibles For The World (BFTW, ​ (www.biblesfortheworld.org) has made God's word available—free of charge—to millions of people in more than 115 countries. BFTW is committed to Christian education and compassionate care, having established a hospital and dozens of elementary and secondary schools, plus a college and seminary in NE India and Delhi.